Thanks to the greed of tiny but powerful industry lobby, congressional Republicans are about to legalize the slaughter of America’s wild horses – and commit political suicide in the process. Polls show that 80 percent of men, 90 percent of women and 86 percent of Trump supporters oppose horse slaughter. With nine Republican House seats up for grabs according to the Cook Report, opposition should be a no brainer. But this hasn’t stopped Interior Secretary Ryan Zinke from leading the charge, while House Republicans have already passed legislation that would legalize an inhumane practice that has been outlawed for fifty years. 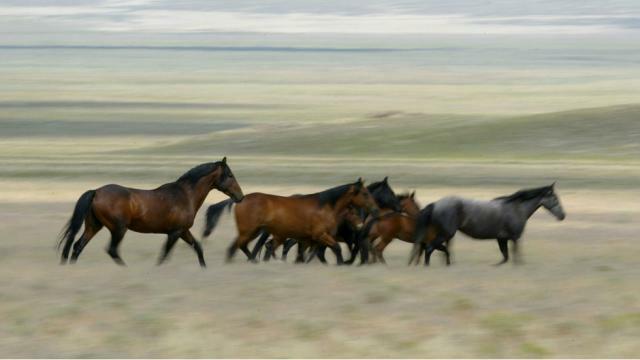 The push to slaughter wild horses is coming from a narrow – but powerful – special interest lobby in the D.C. swamp made up of millionaire and billionaire cattle ranchers on America’s federal lands. Public-lands ranchers make up just 2 percent of U.S. cattle operators, represent just 0.06 percent of total employment in 11 western states and produce only 3 percent of American beef. They already enjoy steep public subsidies not available to 98 percent of America’s 1.1 million cattle ranchers who do not hold public lands grazing permits. But not surprisingly they are eager to expand their advantage, even though it will come at the expense of Republican representation in Congress, perhaps even jeopardize the Trump presidency, and result in the unnecessary slaughter of tens of thousands of wild horses. The goal of the horse slaughter lobby is to clear public lands of horses and replace them with cattle. Naturally the justification offered for the indefensible carnage this entails is that it will benefit the victims. The wild horse herds need to be thinned for their own good lest they starve – so the argument goes. Opening slaughter houses in America would save horses currently being shipped to their deaths in Canada and Mexico from the miseries of the journey. But this is just sickening hypocrisy. Absent the cattle industry land grab, the thinning of the herds can be accomplished in a cost-effective and humane way by the use of PZP birth control. The problem for the land grabbers is that this would delay and thwart their designs to take the land for themselves. Republicans in the House have been misled by Secretary Zinke and their congressional leaders who are part of the swamp. The consequences for Republicans should this legislation pass into law could be severe; the consequences for America’s horses would be devastating. Fortunately, the Senate has still to weigh in. We need a much stronger stand from Republicans on this issue. We need Republican leaders in the Senate to come out forcefully against the House bill, and we need an even stronger statement from President Trump that he will veto any legislation to legalize the slaughter of America’s horses. Protecting America’s heritage, its legacy of greatness is, after all, what President Trump’s presidency is about. He should make clear to his supporters and the American public that defending America’s wild horses is an integral part of his plan to make America safe and secure, and to make America great again. Horowitz is the author of numerous books, the most recent one being “Big Agenda: President Trump’s Plan to Save America”.